I have been an automotive technician since 1993. Over my career I've worked on all types of Domestic, Asian and European vehicles. Specializing in preventative maintenance services such as timing belt replacement, tune-ups, fluid exchanges and 30/60/90k services. I also have an in depth background for brakes/steering/suspension services. I look forward to demonstrating my repair and diagnostic abilities to my customers. Absolutely wonderful. Great service.. Timely and professional. Dominic stayed close 2 hrs past his scheduled time. He was working on the cooling system of a Porsche Boxster that can take awhile to get all of the air pockets out. It just takes time for the system warm up and cool gown to remove the air. The next day after he replaced the thermostat the car runs cooler than ever. Dominic is really a talented mechanic, he is an asset to your company. He is also a great person. Dominic was very professional and honest about the issues of my car. He communicated well by letting me know that he was on his way. He was friendly and knowledgable about cars. He gave me few tips about car care. Overall, he got the job done and even did a test drive before and after the job was done. 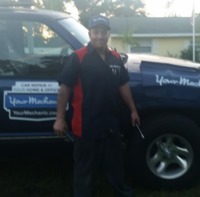 I would highly recommend Dominic to others who are looking to find a honest, reliable and hardworking mechanic. I had a great experience with him. Super nice guy who truly cares about doing a great job and taking care of his customers. Thanks Dominic! Very communicative and did the work great. Thanks!! Great guy, knew what he was doing, would definitely recommend to others! Had to think outside the box to achieve optimum results and he pulled it off with flying colors. On time and courteous. Dominic went to work on my problem and resolved the issue very quickly. He continued to review other aspects of the vehicle and did a very detail review of the car. He told my about other potential issues that may be a future problem. This inspection helped correct potential problems now before they may become major issues. I think Dominic did an excellent job repairing my original problem and his overall inspection of the car was very helpful and informative. Dominic was on time, polite and professional. He got right to work and finished quickly. I would recommend Dominic without reserve. Went above and beyond helping me diagnose my issue. Very professional, and even told me to let him know the result as I told him would do the repair on my own. He was early, communicated when he was in transit, did his work quickly. And he explained what he did and what else he sees. Great job overall. Car repair on a Sunday morning, punctual arrival and efficient service. I would be happy to use his services again. Couldn't have asked for a better mechanic! What I thought was a fuel pump problem turned out to be a not so accurate gas gauge. Saved us from what would have been a huge charge at a regular shop who most likely wouldn't have been so honest. Add to that a great personality and very friendly made for a great experience! Tenacious, knowledge, ambitious, and thorough. He made quick work of my inspection to identify a noisy component and did thorough research to determine replacement part availability, and provided excellent follow up and other recommendations. This man will not leave you hanging. Sort of reminds me of a cross between Bruce Willis and Jason Stratham. The Die Hard Transporter. He definitely delivers. Dominic took the time to explain what the issues were that the vehicle had as well as potential issues. He's professional, honest, and cares about delivering a great customer service experience. Very friendly,, courteous and knowledgeable. He arrived on time and finished on time. Dominic was right on time. We were surprised to get the repairs done on New Years Day! He was very professional, and let us know exactly what needed to be done. He completed the job in a timely manner. We are very impressed, and will request him aigain for any of our future repairs. Dominic is knowledgeable, courteous and professional. Diagnosed my issue . Fixed my car and charged a reasonable price. I will recommend him to anyone looking for a mechanic they can trust.